Slum Soccer uses football - the beautiful game which is unique yet a perfect vehicle that transcends race, religion, language and gender to bring about a change in the lives of slum/street dwellers. 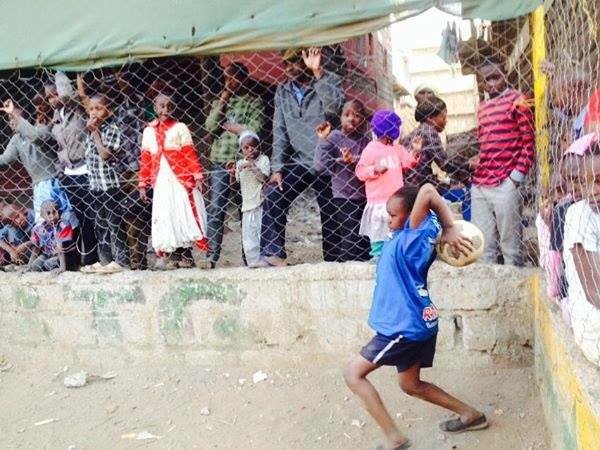 Slum Soccer exists to foster sustainable development within otherwise marginalized populations of Nairobi and other cities. For the love of the game, it turns out as a tool that aims to provide long term solutions to combat homelessness and improve living standards within underprivileged areas. Coach Johnte giving tactical instructions to the Huruma Kambi Moto team. Its approaches are centered on building self-sufficient communities. The game of Football is our means to that end- connecting individuals, teaching life skills and working towards improving overall quality of life. Monday, this week 26 kids from Kambi Moto, Huruma got the opportunity to play in the tournament held in Mathare. All said and done, the biggest factor that enables us to use football as a tool to connect and bring about social development is quite stunningly simple. Football is fun!We believe we are able to bring about increased learning and engagement through utilising this.